I've had this camera for about three weeks, and so far I've been very pleased. It's simple enough that my wife can use it without instruction, and powerful enough that I can tweak it to get creative. I was pleased to see that my old L series lenses fit this camera. I was disappointed that the old flashes are incompatible (430EZ and 540EZ). I just got the new 430EX and it works great. But even with the cheap "kit" lens, I really don't have any complaints. It's a great deal on a camera that will do more than most people will ever need. I just received my Cannon SLR and I couldn't be happier with my purchase. I have read up on several reviews regarding this camera and I have to agree that the quality of the pictures are excellent. Canon is known for it's user friendliness and it hasn't failed yet. Since this is my first SLR purchase, I wanted to make sure that I wouldn't be overwhelmed with too many switches, buttons, etc. Even though I haven't read the manual yet, I have successfully experimented with various settings and I am impressed by the quality of the pictures thus far. I do plan on reading through the manual eventually to get more use out of the camera. Last weekend, I was at an outing and I was pleasantly surprised to see a lot of people using the Cannon SLR Rebel Xsi series. Obviously, this camera is a popular choice for a good reason. I do believe that the money spent on this camera was well worth it. I decided to upgrade from a point and shoot camera to a digital SLR camera 2 weeks ago. I had done hours upon hours of research of what dSLR to get. Some suggested the Nikon route, but I opted for Canon. If you are thinking about getting this, definitely check it out in a store first so you can actually hold it in your hands. Some say it's too small for their hands. I have small hands, so it fits perfectly. But if it's too small, I've heard that some people just add the grip and it works for them (plus the extra stability for heavier lens and the extra battery life). This is the 3rd generation of Canon Digital Rebel that I have had, and they continue to improve in a very positive way. My wife has used a Canon SLR for a number of years, so a Canon EOS was the logical choice when purchasing a digital camera as it uses the same lens. The Camera takes excellent photos and operates very similarly to the film model, only better in many ways. So far, it's been impossible to transfer images from the camera to the computer. We managed to transfer one, but that was it. Other images simply will not transfer. The software doesn't recognize, and refuses to connect to, the camera. Even after reloading the software and trying on a different computer. The Canon help line was absolutely no help! NONE!!! They insist it must be a "computer problem" as "no one else has ever had this problem". Consequently, we must take the memory card to the in-store developer-kiosk and transfer images there, which requires two trips. Great camera for the price. Has a lot of features. I mostly shoot in manual and aperture priority. 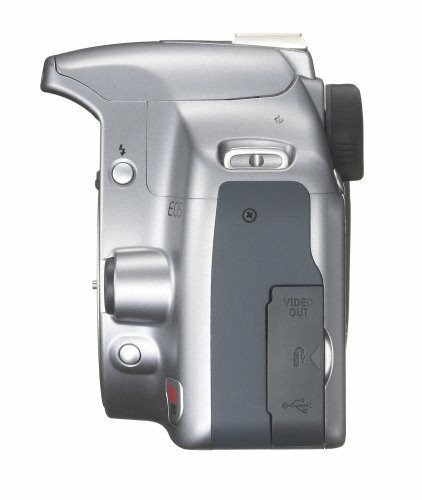 Do keep in mind that this is a cropped sensor camera - I didn't know about cropped sensors before buying this camera. So those of you like me that are switching over from a film SLR will notice that the view finder is a lot smaller then what you're use to. But a full frame will set you back a lot more, so this is a good one to start with. The only thing I was concerned about was megapixels, thinking more is better. But if you're only going to be printing as large as 5x7 than, this really shouldn't be that much of a concern. I've read that the D series (30D, 40D, etc.) produces images with much less noise, so these might be cameras you may want to consider as well. I have owned a Canon EOS 3 film SLR camera for about 12 years and have loved it. I decided to go to the digital SLR since I am going to have daughter in a couple of months and the cost of film and developing is crazy. The lenses on my EOS 3 were interchangeable with the new digital Rebel lens mounting system. This was one of the main reasons that I stuck with Canon. Keeping the lenses and flash I already had saved me about $1000. I have the Canon EF 75-300mm f/4-5.6 IS USM Telephoto Zoom Lens for Canon, the Canon 24-85/3.5-4.5 EF USM Black Zoom Lens Canon AF Zoom Lens and a Canon Speedlite 380EX. All of these products work very well with with the new digital system. I have had this camera for about 30 days and have taken around 500-750 shots. I mainly take landscape/nature and portraits. The quality is excellent. I have taken a whole lot of photos of my dogs and while hiking in the mountains, I live in Arizona. The camera's automatic shooting modes are pretty good but if you can take the time to learn how to use the manual Av and Tv modes this camera is AWESOME! I just bought a new portrait lens, the Canon EF Lens - 50 mm - F/1.8 - Canon EF. It is Canon's lower quality model with the plastic mounting system of lenses but it is very, very good for natural light portraits. As long as you don't need a portrait lens for professional use, this lens is great. This camera picks up every detail and is unbelievable at 12mp. I bought a 8gig SD card to go with it for about $10 shipped. It was the Transcend 8 GB SDHC Class 6 Flash Memory Card TS8GSDHC6. I found it on Amazon. It holds about 1300 pictures at 12mp. It is a great combo for the Rebel body. I bought this camera in December after months and months of research and I absolutely LOVE it! I wanted something that would give me a little bit more opportunity to be more creative. And while my digital point-and-shoot may have had some features I hadn't explored, I just love the feel of an SLR in my hands. There was somethign nostalgic about owning a camera like my dad had when I was little but with modern technology. The only con I can think of is my budget. When I bought the XSi kit, I also got another lens... Since then I've bought books, a flash, filters, a Joby gorilla pod, and all kinds of other accessories! Whew! Canon has come a long way since it first turned the DSLR, the consumer digital version of 35 mm cameras, on it's ear about a half a decade ago. While competitors like Nikon and others have attempted to keep up, equal, or top Canon with a slightly better feature here or there, Canon still leads, the the industry follows. So the question when buying is this, do you want to buy the leader, or are you just a follower. Myself, personally, am not into imitation, and I've tried some of the other units including Nikon DSLRs, which their images always look hard, cold, and slightly off. Sony comes to bat with a lower entry price but not as much support sadly or features, Olympus as well. There's others of course, but really there's Canon and then everyone else. I like this camera, a lot, but have to deduct a half point as it's quality is even cheaper than the original 300D (Rebel XT), the plastics make it feel very toy-like. The other half a point is this camera has quite possibly the loudest shutter ever, next to perhaps those cameras that make the supposed shutter closing sound effect turned up to 11. I've shot with other consumer-grade Canon and Nikons that are much more quiet than this, it's really uncalled for on Canon's part. Perhaps their shutters are made of the same cheap plastic they're using for their cases. The 450D (XSi) is so loud, it borders on frustratingly annoying. Don't use this camera for even slightly hushed performances or places where some degree of silence is required, you'll only irk people. If shooting in even remotely quiet places requires no disturbance you may need to upgrade to a 5D or some such to retain the Canon quality edge and a quieter shutter. There are a lot of things I dislike about digital SLRs. I've been a big fan of 35mm black and white and color slide film for years. With film, I get very graceful degradation (grain). With digital, low light noise is not as pleasing as pushed 400-speed film. I also seem to get more chromatic aberration with digital. Finally, I really dislike the smaller sensor on digital SLRs. It makes all my lenses more telephoto, and increases my depth of field quite a bit. I miss how my 50mm/1.8 EF lens looked wide open; the ability to really blur the immediate background came in handy. I don't know anything about ISOs, image stabilization, or auto focus. I couldn't possibly tell you -- yet -- what half the buttons on my new camera do. But the picture quality is amazing, and I picked up the basics in about fifteen minutes of playing around. The interface is clear and easy to understand, there are more photo options than I know what to do with right now (i.e. "portrait" versus "night portrait"), and my auto-focus is working beautifully. Some other reviewers have mentioned the kit lens, and I agree that it is good for indoor and close shots, but I'll definitely be spending the money on something more powerful for a better zoom. I took it to my niece's dance recital and all my non-flash, far-away shots of the stage were pretty blurry.